Thomas Alva Edison (February 11,1847 – October 18,1931) was an American inventor and businessman whose most important inventions revolutionized modern life. Edison is considered one of the most prolific inventors in history, holding 1,093 U.S. patents in his name, as well as many patents in the United Kingdom, France, and Germany. He enthusiastically pursued practical knowledge, took initiative to substantiate his creativity beyond the technical standards of the time, and with persistent effort, developed many devices which greatly influenced life in the twentieth century and beyond. Dubbed "The Wizard of Menlo Park" by a newspaper reporter, he was one of the first inventors to apply the principles of mass production to the process of invention, and can therefore be credited with the creation of the first industrial research laboratory. Edison was a talented inventor whose creativity improved the quality of life for billions of people and who left the world a better, lighter place for having lived. Edison's ancestors (the Dutch Edisons) emigrated to New Jersey in 1730. John Edison remained loyal to England when the colonies declared independence, which led to his arrest. After nearly being hanged, he and his family fled to Nova Scotia, Canada, settling on land the colonial government gave those who had been loyal to Britain. In 1795, three generations of Edisons took up farming near Vienna, Ontario. Among them was Samuel Ogden Edison, Jr. (1804 – 1896), an erstwhile shingle maker, tailor, and tavern keeper from Marshalltown, Nova Scotia. He married Nancy Matthews Elliott, of Chenango County, New York. In 1837, Samuel Edison was a rebel in the MacKenzie Rebellion that sought land reform and autonomy from Great Britain. The revolt failed and, like his grandfather before him, Samuel Edison was forced to flee for his life. Unlike his grandfather, Sam went south across the American border instead of north. He settled first in Port Huron, Michigan, temporarily leaving his family behind. Thomas Edison was born on February 11, 1847, in Milan, Ohio, to Samuel Ogden Edison, Jr. and Nancy Matthews Elliott (1810 – 1871). Thomas was their seventh child. Edison had a late start in his schooling due to childhood illness. His mind often wandered and his teacher Reverend Engle was overheard calling him "addled." His mother attempted to discuss the situation with Reverend Engle, but she became angry at the rigid ways of that school. She withdrew her son from the school where he had been for only three months. Edison's mother had been a school teacher in Canada and happily took over the job of schooling her son. She encouraged and taught him to read and experiment. He recalled later, "My mother was the making of me. She was so true, so sure of me; and I felt I had something to live for, someone I must not disappoint." Many of Thomas Edison's lessons came from reading R.G. Parker's School of Natural Philosophy, which explained how to perform chemistry experiments at home. His mother introduced this book to him because she was sensitive to his interests and wanted to nurture her son's enthusiasm for learning. Edison commented that this was "the first book in science I read when a boy." After seeing how fascinated he was with chemistry, Nancy Edison brought him The Dictionary of Science. Thomas ended up spending all his spare money buying chemicals from a local pharmacist, collecting bottles, wires, and other items for experiments. He built his first laboratory in the cellar of the family's Port Huron house. Fifteen-year-old Thomas Edison began to lose much of his hearing after injuring his ears in a train accident in 1862. This prompted him to read more. "Deafness probably drove me to reading," he mentioned as an adult. Thomas was so enthralled by Victor Hugo's Les Miserables, especially the stories of lost children, his friends labeled him "Victor Hugo" Edison. Young Edison wrestled with the ideas in Isaac Newton’s “Principles,” finally resolving to take responsibility for practical matters more than spending time theorizing. Edison favorite subject was science, including electricity, mechanics, chemical analysis, and manufacturing technology. Edison's life in Port Huron was bittersweet. He sold candy and newspapers on trains running from Port Huron to Detroit. He became a telegraph operator after he saved Jimmie Mackenzie from being struck by a runaway train. Jimmie's father, station agent J.U. Mackenzie of Mount Clemens, Michigan, was so grateful that he took Edison under his wing and trained him as a telegraph operator. Edison's deafness aided him as it blocked out noises and prevented Edison from hearing the telegrapher sitting next to him. One of his mentors during those early years was a fellow telegrapher and inventor named Franklin Leonard Pope, who allowed the then impoverished youth to live and work in the basement of his Elizabeth, New Jersey home. Some of his earliest inventions related to electrical telegraphy, including a stock ticker. Edison applied for his first patent, the electric vote recorder, on October 28, 1868. On December 25, 1871, he married Mary Stilwell, and they had three children, Marion Estelle Edison, Thomas Alva Edison, Jr., and William Leslie Edison. His wife Mary died in 1884. On February 24, 1886, when he was thirty-nine, he married nineteen-year-old Mina Miller, and they also had three children: Madeleine Edison, Charles Edison (who took over the company upon his father's death, and who later was elected governor of New Jersey), and Theodore Edison. After years of watching the processes of nature, I can no more doubt the existence of an Intelligence that is running things than I do of the existence of myself. Take, for example, the substance water that forms the crystals known as ice. Now, there are hundreds of combinations that form crystals, and every one of them, save ice, sinks in water. Ice, I say, doesn't, and it is rather lucky for us mortals, for if it had done so, we would all be dead. Why? Simply because if ice sank to the bottoms of rivers, lakes, and oceans as fast as it froze, those places would be frozen up and there would be no water left. That is only one example out of thousands that to me prove beyond the possibility of a doubt that some vast Intelligence is governing this and other planets. Thomas Edison died in New Jersey at the age of 84. His final words to his wife were: "It is very beautiful over there." Thomas Edison began his career as an inventor in Newark, New Jersey, with the automatic repeater and other improved telegraphic devices, but the invention that first gained Edison fame was the phonograph in 1877. This accomplishment was so unexpected by the public at large, it appeared almost magical. Exhibiting his keen ability to make the most of a given situation, on July 18, 1877, Edison realized that the stylus (used to read coded indentations on strips of paper) he was testing suddenly began to move rapidly through the indentations causing a friction resulting in an actual sound. It could have been only a slight murmur, but Edison noticed it. As archivist Douglas Tarr at the Edison National Historical Site explains, "Edison seemed to reason that if a stylus going through indentations could produce a sound unintentionally, then it could produce a sound intentionally, in which case he should be able to reproduce the human voice." This is how the idea of a "talking machine" made its way into Edison's mind. Edison became known as "The Wizard of Menlo Park, New Jersey," where he lived. His first phonograph recorded on tinfoil cylinders that had low sound quality and destroyed the track during replay so that one could listen only once. In the 1880s, a redesigned model using wax-coated cardboard cylinders was produced by Alexander Graham Bell, Chichester Bell, and Charles Tainter. This was one reason that Thomas Edison continued work on his own "Perfected Phonograph." 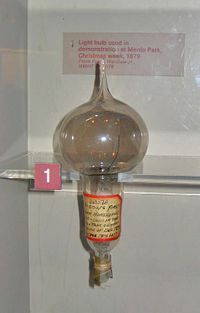 Thomas Edison's first lightbulb used to demonstrate his invention at Menlo Park. Edison's major innovation was the Menlo Park research lab, which was built in New Jersey. It was the first institution set up with the specific purpose of producing constant technological innovation and improvement. Edison invented most of the inventions produced there, though he primarily supervised the operation and work of his employees. In December 1879, William Joseph Hammer, a consulting electrical engineer, began his duties as laboratory assistant to Thomas Edison at Menlo Park. He assisted in experiments on the telephone, phonograph, electric railway, ore separator, electric lighting, and other developing inventions. However, he worked primarily on the incandescent electric lamp and was put in charge of tests and records on that device. In 1880, he was appointed chief engineer of the Edison Lamp Works. In this first year, the plant under general manager Francis Upton, turned out 50,000 lamps. According to Edison, Hammer was "a pioneer of incandescent electric lighting." Most of Edison's patents were utility patents, with only about a dozen being design patents. Many of his inventions were not completely original, but improvements that allowed for mass production. For example, contrary to public perception, Edison did not invent the electric light bulb. Several designs had already been developed by earlier inventors including the patent he purchased from Henry Woodward and Mathew Evans, Moses G. Farmer, Joseph Swan, James Bowman Lindsay, William Sawyer, Humphry Davy, and Heinrich Göbel. In 1878, Edison applied the term "filament" to the electrical element of glowing wire carrying the current, although English inventor Joseph Swan used the term prior to this. Edison took the features of these earlier designs and set his workers to the task of creating longer-lasting bulbs. By 1879, he had produced a new concept: a high resistance lamp in a very high vacuum, which would burn for hundreds of hours. While the earlier inventors had produced electric lighting in laboratory conditions, Edison concentrated on commercial application and was able to sell the concept to homes and businesses by mass-producing relatively long-lasting light bulbs and creating a system for the generation and distribution of electricity. In 1878, Edison formed Edison Electric Light Company in New York City with several financiers, including J. P. Morgan and the Vanderbilt families. Edison made the first public demonstration of the incandescent light bulb on December 31, 1879, in Menlo Park. On January 27, 1880, he filed a patent in the United States for the electric incandescent lamp. On October 8, 1883, the U.S. patent office ruled that Edison's patent was based on the work of William Sawyer and was therefore invalid. Litigation continued for nearly six years, until October 6, 1889, when a judge ruled that Edison's electric light improvement claim for "a filament of carbon of high resistance" was valid. To avoid a possible court battle with Joseph Swan, he and Swan formed a joint company called Ediswan to market the invention in Britain. Edison patented an electric distribution system in 1880, which was critical to capitalize on the electric lamp invention. The first investor-owned electric utility was the 1882 Pearl Street Station, New York City. On September 4, 1882, Edison switched on the world's first electrical power distribution system, providing 110 volts direct current (DC) to 59 customers in lower Manhattan, around his Pearl Street (Manhattan) generating station. On January 19, 1883, the first standardized incandescent electric lighting system employing overhead wires began service in Roselle, New Jersey. Frank J. Sprague, a competent mathematician and former Navy officer, was recruited by Edward H. Johnson, and joined the Edison organization in 1883. One of Sprague's significant contributions to the Edison Laboratory at Menlo Park was to expand Edison's mathematical methods. (Despite the common belief that Edison did not use mathematics analysis of his notebooks reveal that he was an astute user of mathematical analysis, for example, determining the critical parameters of his electric lighting system including lamp resistance by a sophisticated analysis of Ohm's Law, Joule's Law and economics.) A key to Edison's success was a holistic rather than reductionist approach to invention, making extensive use of trial and error when no suitable theory existed (see Edisonian Approach). Since Sprague joined Edison in 1883 and Edison's output of patents peaked in 1880, it could be interpreted that the shift towards a reductionist analytical approach may not have been a positive move for Edison. Counter to this is Sprague's important analytical contributions, including correcting Edison's system of mains and feeders for central station distribution. In 1884, Sprague decided his interests in the exploitation of electricity lay elsewhere, and he left Edison to found the Sprague Electric Railway & Motor Company. However, Sprague, who later developed many electrical innovations, always credited Edison for their work together. Edison also holds the patent for the motion picture camera. In 1891, Thomas Edison built a Kinetoscope, or peep-hole viewer. This device was installed in penny arcades, where people could watch short, simple films. In April 1896, Thomas Armat's Vitascope, manufactured by the Edison factory and marketed in Edison's name, was used to project motion pictures in public screenings in New York City. In 1908, Edison started the Motion Picture Patents Company, which was a conglomerate of nine major film studios (commonly known as the Edison Trust). The Edisonian approach to innovation is characterized by trial and error discovery. This may be a convenient term but it is an inaccurate and misleading description of the method of invention used by Thomas Edison. An often quoted example of the Edisonian approach is the successful but protracted process it is claimed that Thomas Edison used to invent a practical incandescent light bulb. Trail and error alone cannot account for Edison's success with electric lighting when so many others failed (Friedel and Israel 1987 list 23 others) or his remarkable record of almost 1,100 patents (see List of Edison's Patents). 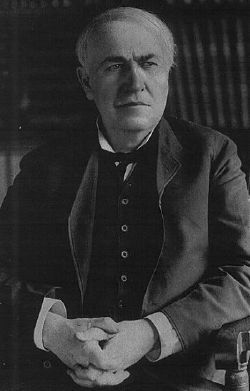 Based on detailed study of his notebooks, a number of scholars have pointed out that Edison generally resorted to trial an error in the absence of adequate theories. For example, in developing the carbon microphone that became the basis of telephones of the next hundred years, Edison and his co-workers tried hundreds of substances, finally settling on lamp black as the variable resistance medium. Edison could not use theory to solve this problem because, as Gorman and Carlson note, at the time "no one had yet developed a chemical theory that Edison could have used to identify a form of carbon with the electrical properties he wanted" (Gorman and Carlson 1990). Edison was not alone in using trial and error (more accurately termed by Hughes as "hunt and try") because he, like others, was working at the edges of the then current knowledge. Thomas Midgley, who held a Ph.D. and was the inventor of tetraethyl lead and halogenated hydrocarbon refrigerants, said of trial and error, "the trick is to turn a wild goose chase into a fox hunt" (quoted in Hughes 2004). Such leading edge work requires a combination of theory and empirical approaches. Edison used a "bottom up theoretical approach" when developing electric lighting, undertaking detailed analysis of the whole electric lighting system based on Joule's and Ohm's laws. This led him to conclude that to be economically successful he had to produce a high resistance lamp (around 100 ohms) (Friedel and Israel 1987). Once he had established the need for a high resistance lamp, he was faced with a lack of electro-chemical theories to describe the behavior of materials when heated to incandescence. It was then that he embarked on a systematic search for a suitable material and for the techniques to manufacture it in economic volumes. Hughes says, "In formulating problem-solving ideas, he was inventing; in developing inventions, his approach was akin to engineering; and in looking after financing and manufacturing and other post-invention and development activities, he was innovating." Edison would "adroitly choose" problems that made use of what he already knew. Edison's method was to invented systems rather than components of systems. Edison did not just invent a light bulb, he invented an economically viable system of lighting, including its generators, cables, metering, and so on. Edison invented by repeatedly trying devices in more complex environments to progressively approximate their final use conditions. Edison blended invention with economics. His electric lighting system was designed to be an economic competitor with gas lighting. Men with skills that would aid the task. Literature on the subject. He started a project with a thorough literature review. An environment where the purpose was invention not something else, like manufacturing. Edison was a charismatic leader who drew on the ideas of those who worked with him. Edison made use of the scientific method but in a way that was limited to the task at hand and did not seek to develop generalized theories. A key to Edison's intellectual approach was to always doubt and never take things for granted. 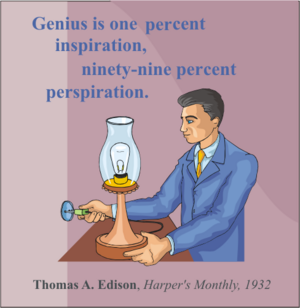 Edison made effective use of metaphors when picturing his inventions. He had a significant ability to grasp quantitative relationships despite his limited mathematical training. He worked by conceiving an idea and working towards achieving it. Edison (and his co-workers) possessed excellent manual dexterity. Edison was also very effective at sketching, enabling him to conceive and manipulate his ideas on paper. Edison did use hunt and try extensively, but only when no theory existed and in a systematic rather than random manner. Nikola Tesla developed alternating current distribution, which could be used to transmit electricity over longer distance than Edison's direct current due to the ability to transform the voltage. It could be said that alternating current was not derivative of Edison's work, but it was related as were the two men. Tesla was a former employee of Edison, and left to follow his path with alternating current—which Edison did not support. Emile Berliner developed the gramophone, which is essentially an improved phonograph, with the main difference being the use of flat records with spiral grooves. The town of Edison, New Jersey, and Thomas Edison State College, a nationally-known college for adult learners in Trenton, New Jersey, are named after the inventor. There is a Thomas Alva Edison Memorial Tower and Museum in the town of Edison. The Edison Medal was created on February 11, 1904, by a group of Edison's friends and associates. Four years later, the American Institute of Electrical Engineers (AIEE), later Institute of Electrical and Electronics Engineers (IEEE), entered into an agreement with the group to present the medal as its highest award. The first medal was presented in 1909 to Elihu Thomson, and to Nikola Tesla in 1917. The Edison Medal is the oldest award in the area of electrical and electronics engineering, and presented annually "for a career of meritorious achievement in electrical science, electrical engineering or the electrical arts." Life magazine (USA), in a special double issue, placed Edison first in the "100 Most Important People in the Last 1000 Years," noting that his light bulb "lit up the world." The Port Huron Museums, in Port Huron, Michigan, restored the original depot that Thomas Edison worked out of as a young newsbutcher. The depot has appropriately been named the Thomas Edison Depot Museum. The town has many Edison historical landmarks including the gravesites of Edison's parents. The United States Navy named the USS Edison (DD-439), a Gleaves class destroyer, in his honor in 1940. The ship was decommissioned a few months after the end of World War II. In 1962, the Navy commissioned USS Thomas A. Edison (SSBN-610), a fleet ballistic missile nuclear-powered submarine. Decommissioned on December 1, 1983, Thomas A. Edison was stricken from the Naval Vessel Register on April 30, 1986. She went through the Navy’s Nuclear Powered Ship and Submarine Recycling Program at Bremerton, Washington, beginning on October 1, 1996. When she finished the program on December 1, 1997, she ceased to exist as a complete ship and was listed as scrapped. In recognition of the enormous contribution inventors make to the nation and the world, the United States Congress, pursuant to Senate Joint Resolution 140 (Public Law 97 - 198), has designated February 11, the anniversary of the birth of Thomas Alva Edison, as "Inventor's Day"
In the Netherlands, the major music awards are named after him. Friedel, Robert, and Paul Israel. Edison's Electric Light: Biography of an Invention. New Brunswick, NJ: Rutgers University Press, 1987. Gorman, Michael E., and W. Bernard Carlson. Interpreting invention as a cognitive process: the case of Alexander Graham Bell, Thomas Edison and the telephone. Science, Technology and Human Values 15(2) (1990):131-164. Hughes, Thomas P. Edison's method. In Technology at the Turning Point, edited by W. B. Pickett. San Francisco: San Francisco Press, 1977. Hughes, Thomas P. American Genesis: A Century of Invention and Technological Enthusiasm 1870–1970, 2nd ed. Chicago: University of Chicago Press, 2004. Edison cylinder recordings, from the Cylinder Preservation and Digitization Project at the University of California, Santa Barbara Library. Complete list of 1,093 patents. Thomas Edison by Gerry Beales. “Edison's Miracle of Light” American Experience, PBS.